The Third Saturday of this month is part of Easter Weekend. The TARTAR event is scheduled near Sacramento this weekend. We had only two folks show up to ride for our last scheduled VCRR group ride, and we won't plan one for this Saturday. If anyone has a suggestion for VCRR Group Rides next month which might entice a dozen or so folks to ride with him (her, them or it), please let me know and I'll post the info with our next website update. Saturday, May 4th: First Saturday VCRR Group Ride – SUGGESTIONS? Saturday, May 18th: Third Saturday VCRR Group Ride – SUGGESTIONS? PLEASE[! ]: If you have any suggestions for group rides for Spring 2019, please share. We're always especially eager to hear from anyone who's been aching to plan, execute and lead the gang on his, her or their favorite venue. 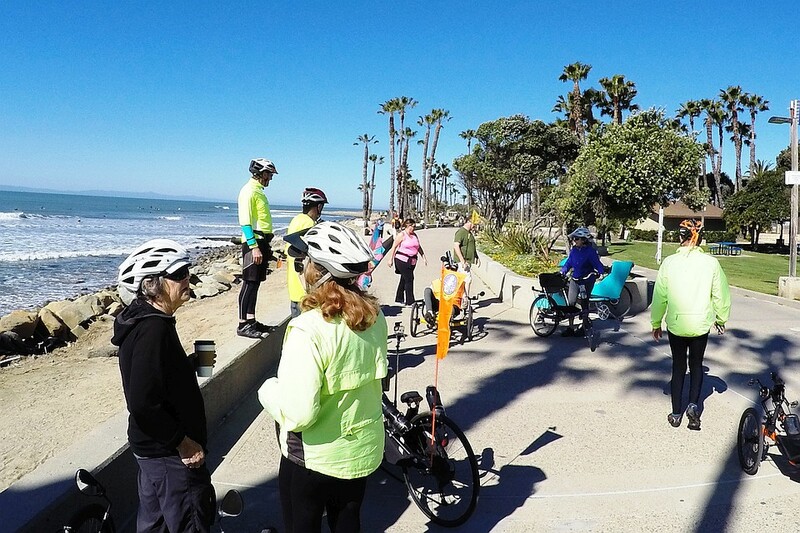 3/16/2019: For our Third Saturday VCRR Group Ride we avoided strong winds by riding from Ventura's Avenue district to Ojai. About 10 of us ultimately did the ride, most meeting at Harry Lyon Park. After routine coffee and munchies, we headed up to a pit stop at Foster Park. From there we climbed upward, splitting into multiple groups as expected for speed differentials. 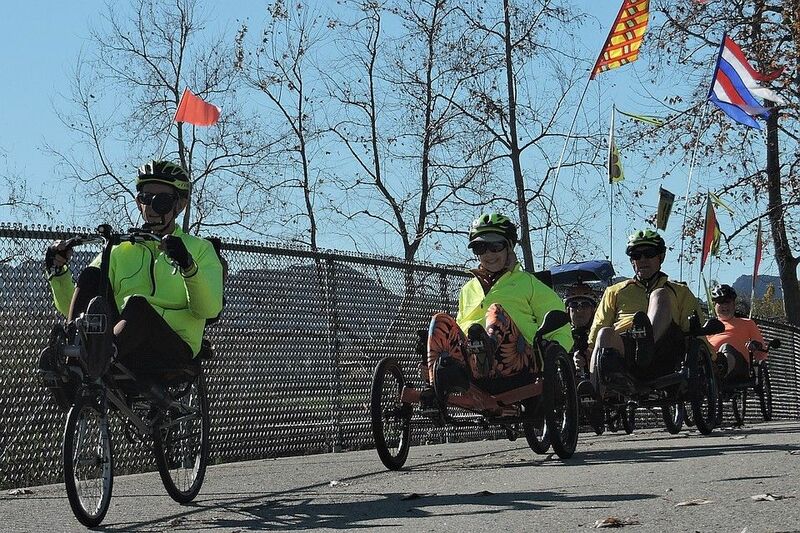 Some of the faster riders chose to ride up Santa Ana Road to the Lake Casitas marina, while the Pokey Patrol people chugged up the Ventura River Trail to our lunch stop at Subway near Mira Monte. After lunch we fully enjoyed the reward of our morning climb, zooming back down the hill to our starting area. 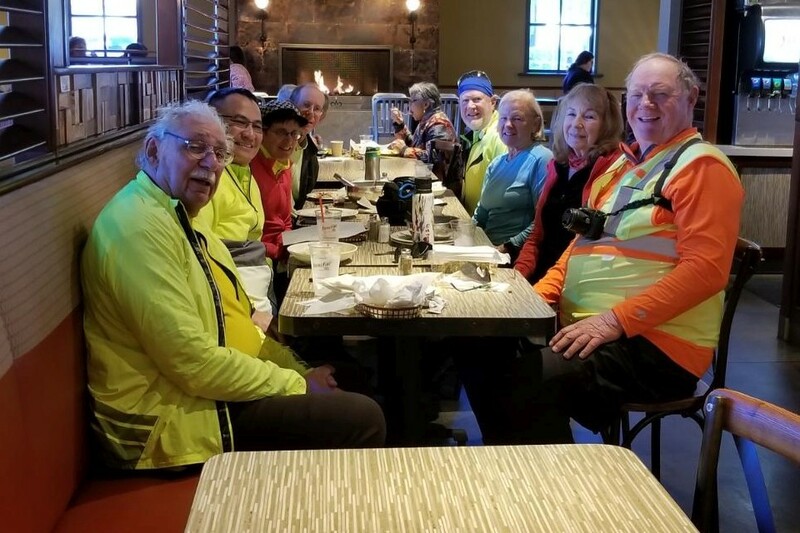 3/9/2019: Our first (but Second Saturday) VCRR Group Ride in March was a repeat road trip to ride in the western San Fernando Valley. This was a nearly perfect day for this area, cool with a mix of blue sky and drifting clouds. However, most VCRRians missed this great opportunity, as only six folks showed up for the ride. 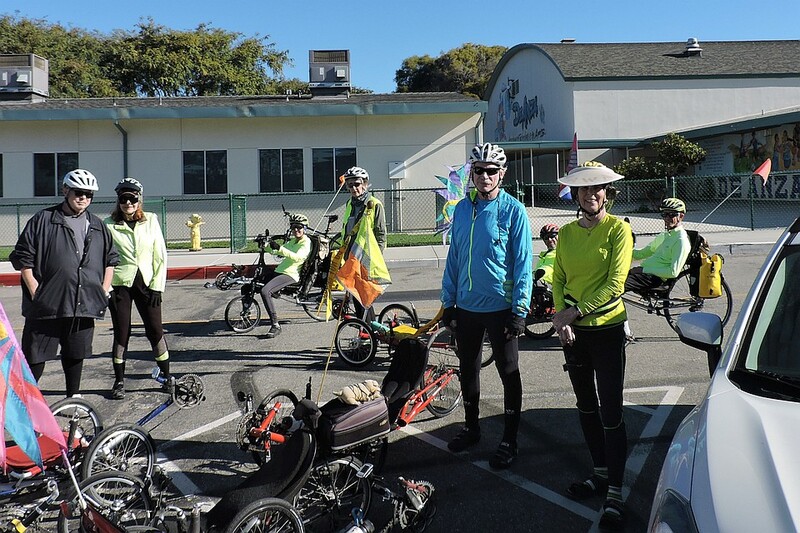 With such a small group we opted to stay together on a simpler route, starting from the Balboa Sports Center and riding up and back along the busway bikepath. We rode up to a pit stop just beyond the Chatsworth Station, and then returned down a (too) short section of the Browns Barranca bikepath and the Orange Line to our lunch stop at the Victory curve. We opted for Chinese and got lucky, enjoying the hot soup, hot tea and a good low-cost meal. After a few more blocks beside the busway, we detoured over to ride the LA River trail. I was a bit surprised to see that the recent flooding had really cleaned up the river channel, leaving it looking as though it had been thoroughly and professionally scrubbed. Water flowing in the bottom notch of the riverbed looked clear enough to drink. This route is about 25 miles, a shallow climb going out and a nice cruise back to the finish. Pix are video frame grabs from Rolly's action cam. 2/16/2019: A small group of us (9 riders) met at Vineyard Park in northeastern Oxnard. After the usual coffee and munchies, we rode around RiverPark, then across the Santa Clara River and up the Johnson Barranca bikepath to a pit stop at Barranca Vista Park. Then we climbed the next section of the barranca MUP to East Ventura Community Park and over to the rocket ride downhill along Montgomery Avenue. After a fun slalom run along Riverview Linear Park, it was another shallow climb back up to Foothill, with the Pokey Patrol taking a little shortcut while the fun guys got another zoom down the Brown Barranca MUP. We regrouped at Chumash Park before pedaling the CA-126 bikepath over to lunch at the StoneFire Grill. We returned via Ralston Street, Johnson Drive and through the Collection for a round trip of 20 to 25 miles, with temps below 60 degrees and afternoon tailwinds. Pix this time are a bad mix of mine and Rolly's; his video (linked below) is the best way to view this ride. 1/19/2019: About 16 of us met at Pitts Ranch Park to ride a slightly different route this weekend. We started up the Calleguas Creek MUP to Upland Road, where the group made its first split. The Faster Folks continued up the climb, while the Pokey Patrol rode back down the creek, with a couple of extra loops to sync up for a pit stop at the Village Commons Sports Park. After a short ride together we split again with the serious cyclists riding a longer loop down into the farmlands, while the rest of us rode Lewis Road and Daily Drive to meet up again for lunch at Presto Pasta. After a very nice and surprisingly low cost meal, we cruised back to the park. Temps were very pleasant with enough sunshine to create serious envy from our counterparts in the northeastern USA. RIDE VIDEOS AND OTHER PIX: Rolly has posted videos from several recent VCRR Group Rides for public viewing on YouTube at this link. We are expecting to post more videos over the next few months, and, of course, your feedback is eagerly solicited. There is also a series of older video clips posted on YouTube, on 'TheVCRR' channel, at this URL. There is a VCRR photo archive on Flickr; to view it, start at this URL. 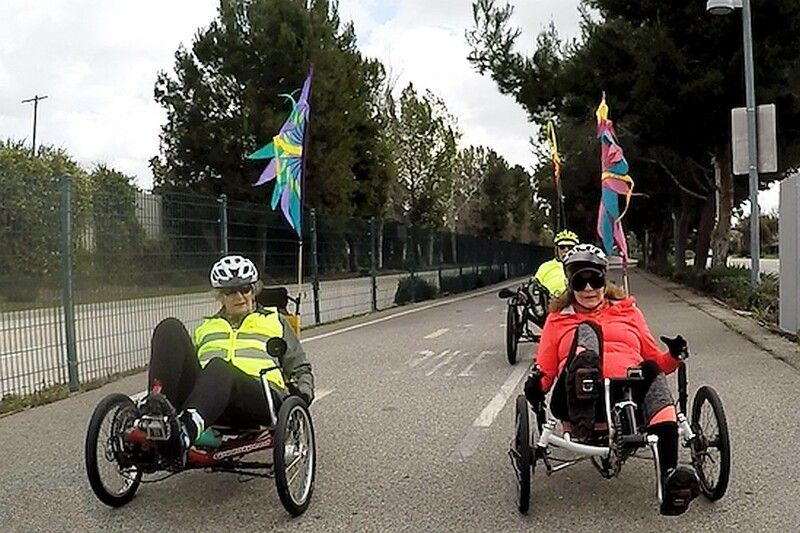 Vincent has posted some of our ride pix to the Recumbent Trikes Group on Facebook (one of several). PLEASE, PLEASE, PLEASE DON'T FORGET! : COMMENTS AND SUGGESTIONS ARE EAGERLY[!] SOLICITED FOR OUR REGULAR GROUP RIDES IN 2019, AS WELL AS FEEDBACK FOR THIS WEBSITE, RIDE NOTICES, PHOTOS, RIDE VIDEOS, ROUTE SHEETS, MAPS, CUSTOM VCRR SAFETY FLAGS AND/OR VIDEO FLYOVERS. We are seriously looking for suggestions for VCRR Group Rides for Spring, either in person, by phone or email. We will continue sending email notices a few days before each upcoming ride, at least for the next couple of months. Please let me know if you want to make any changes to our email list.